Travel the world in unexpected style! 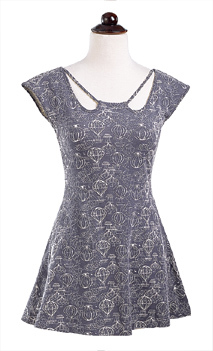 Let your imagination soar in this top, printed with old-fashioned hot air balloons. Top is lightly fitted, drifting to a full, floaty hem. Substantial cotton knit with spandex has comfortable stretch to let you fly freely, without cling. Two side-seam pockets. Imported. Cotton/ spandex; machine wash. Sizes S-XL.